This paper examines the case of indigenous privatization of the important fodder tree samata (Euphorbia stenoclada) and concurrent legal curtailment of this privatization among the Tanalana people of southwest Madagascar from a long-term perspective. Applying a framework for institutional change to empirical data derived from interviews conducted in 20 villages in the Mahafaly Plateau region, the study explores the process and mechanisms involved in creating and asserting private property rights to this common pool resource on the one hand, and the process of curtailment on the other. Implementation of the curtailing institutions is hampered by (1) the low bargaining power of village communities versus privatizers, which stems from the users’ preference for avoiding open conflicts and laissez faire ideology, (2) the low social acceptance and internalization of new curtailment rules, which are perceived as contradictory to customary resource privatization rights and the ideology of personal freedom restricted only by ancestral rules-in-use, and (3) ineffective self-governance and enforcement mechanisms based on pro-active monitoring of local users. Stressing the interplay between ideology and bargaining power in the context-specific constellation of actors, this paper contributes to the understanding of the transformation of property rights and institutional change in self-organized, traditional societies. Privatization of pastoral common pool resources is a widespread phenomenon in Africa and is often initiated by the local user communities (Behnke 1985; Ensminger 1997; Lesorogol 2003). Much effort has gone into identifying the drivers of such property rights transformations: population growth, immigration, resource use conflicts, commercialization, infrastructural development, technological change and intensified agriculture (Ensminger 1996, 1997; Woodhouse et al. 2000; Cleaver 2002; Lesorogol 2003, 2008; Desta and Coppock 2004; Kamara et al. 2004; Behnke 2008; Haller 2010; Beyene 2011). However, to date, little empirical work has been done to establish the processes and mechanisms that translate the motivation of individual users or groups into a stable transformation of property rights (Mwangi 2007). The present paper adds to our understanding of local property rights transformation by discussing the processes, mechanisms, and forces that led to the establishment of private property rights to a pastoral common pool resource among the Tanalana people in southwest Madagascar. What are the mechanisms underlying the assertion of new private property rights via spontaneous enclosures? How did the process of legal curtailment of private property rights by local communities develop? Why did the local communities fail to implement and enforce the curtailment? The paper is structured as follows: Section 1 presents the theoretical framework for our study. Section 2 gives an overview on the local livelihoods, especially the use of Euphorbia stenoclada, the types of institutions governing natural resource use, and the Tanalana people’s social organization. This is followed by a section on methods. Section 4 presents the empirical results, portraying the current and former property rights regimes, the processes of privatization and the emergence of curtailment, as well as its implementation and the difficulties associated with it. The penultimate section discusses the present case in relation to findings from the literature, followed by a conclusion. This study uses the institutional change framework provided by Ensminger (1992). This framework (see Figure 1) is particularly suitable for our analysis as it focuses on the factors scholars have found to be crucial for property rights transformations on the local level: the behaviour of competing individual actors striving to achieve the institutional outcome with the best distributive effects or other individual benefits (Anderson and Hill 1990; Lesorogol 2003; Mwangi 2007), shaped by their ideology, preferences and bargaining power (Ensminger and Knight 1997; Di Gregorio et al. 2008; Haller 2010). Framework for institutional change by Ensminger (1992, 10) with an extension by Haller (2010). Bargaining power as the ability “to get something one wants from others” (Ensminger 1992, 7) may arise from social position, economic wealth, or the ability to influence the ideology of others (see also Knight 1992). As a consequence, institutional change mostly serves those who best defended their position during the bargaining process, but is not necessarily more efficient nor does it necessarily serve the majority of actors or the community (Ensminger and Knight 1997). The benefits actors strive for are material as well as non-material, including “power, status, and even the ability to assert one’s own ideological preferences over those of others” (Ensminger and Knight 1997, 5). Benefits are determined by relative prices or “the value of something in relation to what one must give up for it” (Ensminger 1992, 4). Changes in relative prices (also see Demsetz 1967; North and Thomas 1973; Libecap 1989) as a driver for bargaining for institutional change are in turn induced by alterations in ‘external factors’ (see Figure 1). These are changes in the social and physical (ecological) environment, the population and technology (Ensminger 1992), but may also originate in the political and economic environment (Haller 2010). Ensminger emphasizes that the analysis of institutional change furthermore needs to consider the internal interplay (see Figure 1) between bargaining power and the actors’ ideology, organization and existing institutions. Ideology refers to the people’s values, mental models, and ideals. Organization is defined by Ensminger as the body in which the actors organize themselves in order to achieve certain common purposes or objectives and act collectively. More specifically, we understand this as the constellation of actors, e.g. roles and authorities for rule creation and enforcement in the village society. Institutions are understood as formal rules (given by the state or a community), informal constraints such as social norms, and their corresponding enforcement mechanisms including self-imposed standards of behaviour. For our analysis, we also distinguish between appropriation rules “restricting time, place, type of technology and/or [resource] quantity”, and provision rules determining whether “labor, material or money” are required to use the resource (Ostrom 1990, 92). The related property rights specify the right of access, withdrawal, management, exclusion, and alienation of a resource (Schlager and Ostrom 1992). The property rights regimes resulting from these specific rights can take the shape of private property regimes conferring ‘exclusive rights’ upon individuals, common property regimes with a set of rules defining the conditions regarding collectively used natural resources, and open access regimes where use by individuals is not regulated at all (Swallow and Bromley 1995). The Mahafaly Plateau region is situated in southwest Madagascar in the dry forest ecoregion south of Toliara. The region is divided into the plateau zone itself and the coastal plain next to the sea. The study area covers the coastal plain between the villages of Soalara in the north and Vohombe in the south (see Figure 2). The area is administratively divided into municipalities (fokontany) usually covering a village and its surroundings with between 200 and 1,230 inhabitants (SULAMA, unpublished data), and larger communes. Figure 2 depicts the borders of the three communes Soalara, Beheloka, and Itampolo in 2010, the peak year for curtailment attempts. Map of the study area (commune delimitations from 2010). The coastal plain is inhabited by the agro-pastoral Tanalana people and Vezo fishermen. While nearly all Tanalana households carry out subsistence farming, their economic situation allows only approximately 40% of them to raise zebu cattle. The number of zebu owned by those households varies widely (up to 200 cows or more, on average 18.5 heads, unpublished project data). Zebu cattle, the Tanalanas’ ­“walking savings accounts” (Kaufmann 1998, 133), are frequently bought and sold, or received and given away at cultural events. Women do not directly possess animals and are not involved in livestock-keeping issues. The herding of cattle is normally done by unmarried teenagers taking care of their father’s or somebody else’s herd. Cattle raising on the coastal plain is influenced by strong seasonal variations and low fodder supply due to sandy soils and low precipitation rates of ­300–350mm/year (UPDR 2003). From the end of November on, the cattle herds leave the coastal zone and spend the next four to six months on transhumance in the neighbouring plateau zone. Access to fodder and water on the plateau is generally free, and transhumance destinations are chosen independently by herd owners (see Goetter 2016). After their return, the coastal plain’s grazing grounds provide enough grass for open grazing for approximately two months. From May/June until the end of November, the grasses are depleted and the animals are fed on the succulent samata tree (Euphorbia stenoclada Baill, see Figure 3). This tree has become the main dry season fodder since the natural stands of raketa cactus (Opuntia dillenii) were killed off by cochineal infestation in the 1930s (Battistini 1964; Middleton 1999). Cattle eating chopped samata (Euphorbia stenoclada). During the day, the herd roves in the grazing ground and spends the night and often also feeding and resting hours in its permanent corral located on the grazing ground. There, the samata is prepared by clipping its branches directly at the stem and then cutting them into slices. As dry samata cannot be digested by the animals, it cannot be stored. Clipped trees can be used again in one to three years. Regrowth rates vary according to the erratic pattern of precipitation and the proportion of branches clipped. Around 22% of clipped trees in the region have died due to overuse (Goetter et al. 2015). The removal of other shrubs for stimulating the trees’ growth has turned the area into a “samata landscape” (Kaufmann 2004, 351). However, at the time of our fieldwork, methods of propagation using cuttings or seeds were unknown to the pastoralists. Agriculture is done mainly on (semi-)permanent fields. Although there are still no formal land titles, fields are traditionally the private belongings of households or extended families. People acquire new fields by automatically owning the patch they cleaned (Blanc-Pamard 2009; Middleton 2013). However, the agricultural area of some Tanalana villages is subdivided among the different local clans (raza) and clearing rights are then limited to the corresponding clan area. As is common in Madagascar (Middleton 2009; Andrés-Domenech et al. 2014), the bushland used for grazing has traditionally been an open access resource often considered as “no man’s land” (Rakotomalala 1990, 47). Besides customary land rights, the southwest of Madagascar is known for being mostly governed by indigenous institutions. Since the time of French colonial rulers, who struggled to impose their rules on the southwestern people “of wild and bellicose temperament, rebels against all social discipline, fiercely defensive of their independence” (Lyautey 1935 quoted in Middleton 1999, 232), institutions created by national or regional state actors (e.g. the commune) have had very little impact on local life. Locally relevant institutions are mainly community rules (dina) and ancestral rules, customs (lilin draza) and taboos (faly) handed down through the centuries (see Thielsen 2016). At the same time, the southwestern canon of traditional institutions has been less extensive and its rules less explicit than in other regions of Madagascar (Hoerner 1990). While these ancestral institutions target all Tanalana people or members of a certain clan, the community rules target the inhabitants of a municipality. Community rules are crafted by a consensus-oriented decision taken jointly by all (male) municipality members (fokonolo) at an open meeting. The communication of new community rules and other community decisions to the next higher administrative level of the commune is up to the elected municipality heads, who are also responsible for supervising the implementation of and compliance to these rules. Additionally, religious and social issues may be treated by the advisory and consultative traditional authorities of the clans and the subordinated lineages (mpitan-kazomanga). Given the scarcity of written documentation on the region, this qualitative case study is based principally on primary data gathered from fieldwork. Between 2011 and 2013, in total 111 in-depth open, semi-structured and structured interviews were conducted in 20 Tanalana villages of the study region (see Figure 2). Most interviews were held in villages of the Beheloka commune (N=78) where privatization and regulation is most advanced; a smaller number were held in the communes of Itampolo (N=23) and Soalara (N=10). Interviewees included users and non-users of samata, traditional clan authorities, and municipality (vice) heads. Because frequently the aim was to collect data from living memory about the former traditional samata property rights regime and the processes of privatization, we sampled mainly male villagers between the ages of 30 and 69 years (75%). However, to capture a wide range of perceptions and views, younger men were also interviewed (age range: 15–75/80 years, ages partially based on estimation). The interviewees were also asked about patterns of pastoral mobility, modes and strategies for using samata stocks, and current versus former degrees of scarcity and influencing factors. To get a better understanding of the situation, we visited the samata stocks of 13 villages together with local guides, discussing the local distribution of private samata stocks and signposts of private property rights. All open and semi-structured interviews (N=81) were conducted by the first author with simultaneous interpretation from English into the local dialect by Malagasy research assistants. The structured interviews (N=30) were conducted in pure Malagasy by one of the assistants, using a questionnaire designed by the authors. The interviews were recorded, transcribed and digitized. An inductive and deductive content analysis (Patton 2002) was done using the QDA software Atlas.ti for descriptive, pattern, in vivo, attribute, and causation coding (Saldaña 2013). The results first describe the current property rights regime for samata at the time of our fieldwork (2013) compared to the earliest situation interviewees could remember (around 1960, when Madagascar gained independence). The next section examines the development and assertion of the private property rights, followed by sections on subsequent attempts to curtail privatization by creating local rules, and reasons for the failed implementation of the curtailment. According to interviewees, all samata stocks on the grazing grounds were formerly used in a manner equivalent to an open access regime. There were no private property rights nor appropriation or provision rules for this common pool resource, except that all use of trees in the vicinity of graves was – and still is – forbidden by an ancestral taboo. The non-existence of any ancestral or colonial rules is supported by the complete lack of records on samata in the otherwise broad body of literature on colonial policy relating to rural life and livestock raising (see for example Middleton 1999; Eggert 2001). 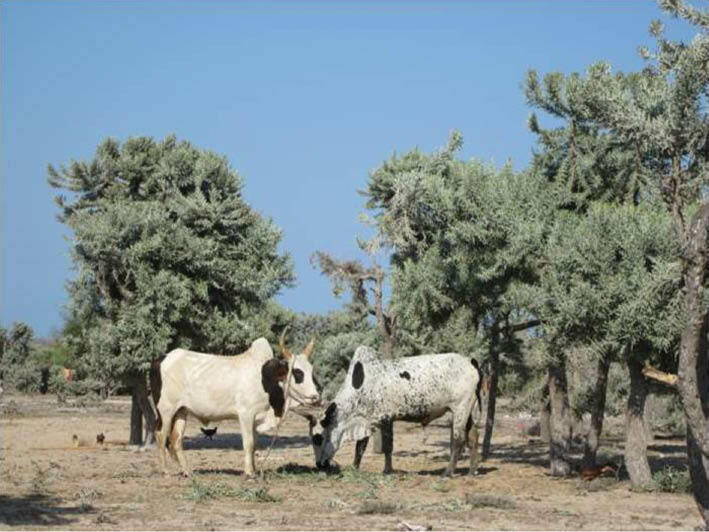 Corral samata: The most widespread private rights to samata are rights to the trees surrounding the private livestock corrals situated on the common grazing grounds. Because people perceive the trees within a certain radius around the corral per se as private property of the corral owner, this property right is very rarely indicated by fencing or otherwise signposting the area. Samata enclosures: In most villages, private rights to samata stocks in the agricultural area also exist. These rights are created by fencing plots with hedges, in a similar way to agricultural fields. Additionally, some villages have clan land in the grazing area. That land is currently either under open access for all clan members or it has been privatized by individual members by enclosing parcels. Marked samata: In some villages, people claim private property, especially exclusion rights, to samata stocks in the community grazing area by marking these as private with lines of cactus plants, a traditional way of demarcating private property. Whereas the private rights to corral and marked samata relate only to the trees themselves, private property rights to samata enclosures also include the land itself. Corral samata and enclosures are equipped with the whole bundle of private property rights, including the right to sell samata. However, the right to samata around the corrals is tied to the usage of the corral by the owners, and thus to the possession of livestock. The first emerging private property rights were those for corral samata. Long ago, according to some interviewees in ‘ancestors’ times’, only the trees within a very small radius around the corral were perceived as private belongings. This radius began to increase steadily around 50–60 years ago. Samata enclosures and marked samata only emerged 20–30 years ago. All private property rights developed as an effect of the cumulative behaviour of villagers. As unanimously claimed, ‘some started’ to claim exclusion rights by fencing, marking, or orally in the case of corral samata, and the others ‘just followed’ or ‘just copied’, or were even directly encouraged by the privatizers. Interviewees clearly indicated that the external factor leading to marking and enclosing samata was a growing overall scarcity (Figure 4). Fifty to sixty years ago, the samata was said to be much more abundant than today, both in terms of the number of trees within a certain area and the biomass per tree. Scarcity of samata was perceived both in the sense of being insufficient to feed all the cattle in a village, as well as of insufficient access of a person to feed his own cattle. Interviewees specified the following factors leading to samata scarcity: The supply has been diminishing due to (1) reduced growth and reproduction rates caused by less precipitation, (2) the turning of samata-stocked land into new hamlets and agricultural fields due to population growth, and (3) incomplete recovery or death of trees after inappropriate clipping of branches or even chopping down the whole stem. Demand has been increasing due to (1) a diminished growth of other fodder plants caused by the changed precipitation pattern, (2) higher total cattle numbers in the region due to population growth, and (3) a shorter transhumance period, prompted by herders’ fear of the now frequent cattle raids on the neighbouring plateau. In addition, the majority of Tanalana people living on the plateau have started to send their cattle to the relatively secure coastal plain (see Goetter 2016). The framework for institutional change (Ensminger 1992) applied to the privatization process. Especially after the year 2000, privatization accelerated. Where spatially possible, people increased their private stocks by creating new samata enclosures or enlarging existing ones (parcels of up to 7 ha were reported). Furthermore, it is also common and socially acceptable to transplant young trees from the common grazing grounds to the enclosures. Factors fostering the acceleration of privatization were the depletion of community samata stocks, an unequal distribution of already existing private samata leading to shortages in individual access, and the emergence of the market for samata use rights turning private samata into a cash income source (see below). Privatization has today become a common action even among non-cattle-owners who want to sell or ‘secure their share’ for the time they or their children would be able to raise cattle. The unequal distribution of private samata stocks implies that some people hold large private plots which are more than sufficient to cover the demand of their herd, while others own only few private plots or none at all, as there are no attractive plots for privatization left. The latter group is highly dependent on the remaining open access community stocks. However, these are often severely depleted, much more than the private stocks (see Figure 5). This is mainly due to a common strategy: first the animals feed from the open access stocks until these are depleted for the rest of the feeding season, and only then are private samata resources used. On a regional scale, common and private stocks are of better quality and quantity in the south, especially south of Behazomby. In the northern villages, the total amount of local stocks was often perceived as insufficient to feed all the cattle in a village. Private (left) and open access stocks (right) of Euphorbia stenoclada in the study region. A regional market for annual harvesting rights to samata stocks has emerged since the mid-1990s, with a heavy price increase after 2010. Harvesting rights are sold for trees of a determined area, e.g. one hectare. Prices per area differ according to the quantity of available fodder per area, which depends on tree density and crown diameter. Converted to the amount of samata needed to feed 15 cattle for five months, prices ranged in 2012/2013 between 17,250 and 855,000 MGA (5.64-279.49 $, exchange rate: 1$ = 3,036 MGA, oanda.com, 4.8.2015) or if paid in cattle between 0.2 and 6.3 heads of cattle (mainly 2-year olds). The price depends heavily on a buyer’s bargaining and his relationship with the seller. In addition, prices are slightly lower in the southern region. The social acceptance of privatization was initially very high and only restricted by social norms of ‘do not take more than you need’. The social legitimation of corral samata builds on ideological as well as practical arguments: Because it is assumed to have existed since ancestral times, many people see it as part of the ancestral custom and therefore a right thing to do. Besides, it is seen as practical when the owner can be sure of being the only one using the trees around his livestock corral providing vital shade for his animals. Samata enclosures are also largely accepted since they are established in the agricultural area which is perceived as the property of a clan and its members. Also, for many villagers, the work involved in fencing the enclosures with hedges, often combined with an effort to enhance the samata trees’ growth by removing other bushes, is enough to legitimate private property rights. Marked samata, on the other hand, is often perceived in an ambivalent way. As it only exists in the grazing grounds which are open to everybody’s livestock, marking is mostly perceived as a selfish ‘taking over’ of samata. However, any type of privatization was also often expressed in a positive notion of ‘protecting samata for the future’ or ‘managing’ it, in positive contrast to the much more degraded open access stocks. Furthermore, many villagers explained that in the beginning they had a laissez-faire attitude towards the privatizers claiming new private property rights, as they did not perceive samata as a scarce good. Despite this initial broad acceptance and laissez-faire attitude, over time many villagers began to disapprove of the accelerating privatization. The argument most often used was that privatization diminishes the overall stock and thus leads to overall scarcity. The privatizers were blamed for intergenerational unfairness, that means, for not leaving ‘anything for future generations’. Furthermore, privatization is said to create social tensions in the village communities, specifically ‘fights’ for specific samata stocks between individual persons. Thus, the socially ideal system was mostly said to be one of open access stocks with only some private rights to corral samata, or without any private property rights at all. The discontent was also motivated by attitudes towards ownership of the land. The area around the village was perceived as belonging to the state, the village community, the Christian God, or the traditional creator-God (zanahary), which implies that ideally all people of the region or the community should have free access to the samata. Thus, it was perceived as unfair and selfish that the privatizers had taken so many stocks for their exclusive personal use. Furthermore, the new development broke with the formerly existing unspoken common sense that the samata belonged to those using it, thus only the livestock owners. In addition, a person may be ‘strong’ due to his economic wealth. He may win a conflict by bribing the police to arrest the adversary, or by paying bandits to steal his cattle. Although none of the interviewees could recount a concrete incident, all insisted that fear of such a conflict is the main reason for the passive behaviour of non-privatizers towards the ‘strong’. Thus, active intervention and direct confrontation was said to be very rare; out of fear most people merely complained to the local authorities. The framework for institutional change (Ensminger 1992) applied to the curtailment process. The earliest community meeting and rule creation took place in the municipality of Marofijery in the mid-1990s. In most other villages, meetings aimed at legally curtailing privatization did not take place before 2010. In addition to curtailment attempts at the municipality level, local and regional actors initiated attempts at the commune level as well. For the Beheloka commune, rules for curtailing privatization were created in 2010 by the commune head, prescribing that everybody is allowed to have a maximum of one hectare of private samata. Following this, even communities that had still not decided on a curtailment were forced to directly apply the regional rule (at least de jure). The process was initiated by the municipality heads and the regional traditional authority of the large Tevondrona clan who convoked a meeting with representatives from all corresponding lineages and municipalities. At the end of our fieldwork (2013), in the two communes Soalara and Itampolo, a curtailment has not been crafted regionally, and in many villages the creation of local rules is still ongoing. Given these different attempts to curtail privatization, officially valid rules for samata use vary between villages. The new rules mainly regulate the right of privatization, but appropriation and provision rules for the community stocks were not created. However, some few communities agreed on using the trees in a more sustainable manner, specifically by leaving a certain amount of branches intact and not cutting the stem. The agreements on privatization on the one hand declare marking samata on the grazing grounds invalid (all communities dealing with this phenomenon). On the other hand, private property rights to samata for a specific zone around the corrals got accepted in all communities. Most ­communities also took a decision as to whether these rights apply to all livestock corrals, or only to those of zebus (both outcomes), and often limited the number of corrals to one per herd. Also samata enclosures in the agricultural area were accepted nearly everywhere. Furthermore, most rules set a certain maximum size for an individual’s total holdings, or his enclosed samata respectively. Holdings exceeding the permitted size have to be reduced or given up. Rules on how to respond to cases of non-compliance (e.g. oversized parcels not being reduced) were only created in very few municipalities and then indicate sanctioning fees, but no fixed deadlines for actions by privatizers or authorities. The interviewees’ knowledge of the rules valid in their community was often rather limited, leading to diverging statements about the sizes of individual parcels or total holdings of private samata permitted in a particular commune or community. In the Beheloka commune, for example, statements about the permitted parcels around the corral ranged from a radius of 5 m up to 100 m and from 0.5 to 1 hectare space. Furthermore, the oral legislation process of new community rules by public creation led to diverging local perceptions. The same village meeting was described by some participants as having culminated in agreeing to curtail the privatization in this or that way, while others insisted that they did not come to an agreement. Also the interviewees’ perception about the origin of the rules for their community varied widely, especially in the Beheloka commune. There, it was mostly stated that the rules were created by the village community, or by the Tevondrona’s traditional authority. However, few interviewees knew that their local rules had actually originated from a meeting of authorities at commune level, or that this meeting had invalidated older local agreements. It was often mistakenly assumed that the Tevondrona’s authority had bindingly limited private claims to a certain size. The authority himself remembers having unsuccessfully campaigned for the abolishment of all private rights to samata. The framework for institutional change (Ensminger 1992) applied to the implementation of curtailment. The majority of interviewees also did not believe that the local community itself has enough power or even willingness to enforce the rules. Enforcement relies on the active monitoring and reporting of deviant behaviour by all individual villagers, meaning that no one has been given a specific mandate and thus legitimization or incentive for this. For various ideological reasons, the villagers’ individual motivation for engaging in monitoring and reporting deviant behaviour is generally low. Although the great majority of Tanalana interviewees perceived the current situation of privatization as ‘bad’ because it creates social tensions, there is no ancestral rule or taboo that forbids privatization. As a consequence, it is not morally bad per se and at best perceived as a peccadillo. Thus, most Tanalana do not condemn others for ‘fencing as much as they can’. It was even often stated that today, only ‘lazy’ people would not try to get private parcels. In villages with no areas left to appropriate, not owning much samata is perceived as a personal lack of far-sightedness or the ‘bad luck’ of ‘having come too late’. As selling samata has become an important means of livelihood, owning samata has become widely accepted, even for non-cattle owners. In sum, the curtailment of samata privatization seems to have reached a status of having failed, as the new regulative rules have not reached the status of rules-in-use and are thus seen as non-binding. The private property rights to samata, however, have been met with high social acceptance. Thus, the privatizers de facto won the bargaining over property rights, while those actors bargaining for their restriction lost. The present case study depicted the privatization mechanisms of an important fodder resource among agro-pastoralists in southwestern Madagascar as well as the process underlying local attempts to curtail privatization, and the reasons for its failed implementation. In the next sections we address the research questions posed in the introduction. The samata privatization mechanisms described in the case study follow a very typical pattern where growing scarcity of a resource triggers step-by-step privatization by the resource users. The factors causing scarcity of the samata stocks are also widely known from other cases of dismantling of common pool resources: population growth (Niamir-Fuller and Turner 1999; Haller 2010), lower regeneration rates caused by climatic changes (Desta and Coppock 2004; Beyene 2011), higher pressure and overuse of the open access stock caused by the emergence of private stocks (Williams 1996). However, unlike many other cases, the privatization was not driven by changes in the regional and household economy (Ensminger 1997; Desta and Coppock 2004; Namgail et al. 2007) or the overall political and economic system and its policies (Ensminger 1996; Getachew 2001; Kamara et al. 2004). The unequal distribution of private stocks among the users resulted in a perception of acute scarcity among those who did not secure their share early and then increased the pace of privatization in the logic of “enclosure begat enclosure” (Behnke 2008, 334). Finally, as the value of samata rose due to scarcity and new opportunities to market it, a race for property rights developed wherein land users “rushed to compete for the rents” (Anderson and Hill 1990, 195). In this way, private parcels could spread, as many pastoralists initially did not care if other villagers privatized parcels. This is due to the specific circumstances: First, unlike most other cases of indigenous resource privatization, the former property regime governing samata was not a common property rights system, but a situation of unregulated open access typical for the economic frontier (Anderson and Hill 1990). Thus, as often reported (cf. Taylor and Singleton 1993; Agrawal 2000), only aggravating resource scarcity led resource users to care about how others use the resource and caused conflict over privatization. Second, the Tanalana’s ideology made claiming private property rights to corral samata and enclosures highly reasonable. During the whole privatization process, the privatizers have been ‘change agents’ able to create new individual property rights by continuing and recurring privatization actions. Unlike the typical pattern of distribution of common pool resources, in this case it is not the local elites who are the most active and successful in capturing the resource (Woodhouse et al. 2000; Mwangi 2007; Behnke 2008; Di Gregorio et al. 2008; Beyene 2010), but ‘strong people’. Their specific ‘menace power’ (Theesfeld 2011) to enforce their claimed rights derives from their indifference towards social gossip and the creation of conflict. Although over time many villagers felt discontent with the ongoing privatization, efforts to curtail it were hampered by the villagers’ fear of the privatizers’ reactions, and of conflict in general. The governance structures of the Tanalana society rely heavily on community self-organization, whereas state administrative structures have only limited power. Indeed, the rule creation process in the communities brought about by collective action was often slow and not in all villages successful. Nevertheless, in many villages and also on the Beheloka commune level, it led to community rules for curtailing privatization of samata. Most local curtailment efforts started at a time when many people including non-livestock owners had already ‘secured their share’. This situation explains why most communities decided to legitimate private property rights to samata while at the same time a property rights regime similar to the former open access situation was said to be best for the communities. The very unequal resource distribution among the users led to a situation where reaching consensus on curtailing privatization is very difficult or even impossible, as all actors fight for their position (Libecap 1989; Becker and Ostrom 1995). However, the results show that villagers frequently only agreed to the proposed curtailment rules in order to avoid open conflict, but did not plan to drop their claims to private parcels. Several attempts to curtail the privatization were made by traditional and administrative authorities; however, the enforcement of the new community rules turned out to be very difficult for a number of reasons: First, the villagers’ individual motivation to obey the new rules is very low, although these were mostly created by the villagers themselves, or at least that was how the situation was perceived. This confirms the observation that “achieving consensus does not mean internalizing motivations” (Ensminger and Henrich 2014, 31). Second, the specific governance structure implies that enforcement of the rules depends to a large extent on the pro-active collective action of the villagers, especially when it comes to reporting illegal privatization to the municipality heads and demanding sanctioning. The Tanalana have a long-standing tradition of self-governance, and community rules in rural Madagascar are generally said to be more effective in inducing compliance compared to state regulation (Horning 2008). Also most other pastoral systems in Africa rely on popular enforcement (Niamir-Fuller and Turner 1999). In this case, however, the high bargaining power of ‘strong people’ ready to defend their personal benefits against public discontent coincides with a very low motivation of individual villagers to directly oppose against those people. The described low motivation, as well as the generally low acceptance and internalization of the curtailment rules are mainly grounded in the fact that restricting someone’s behaviour runs contrary to the Tanalana’s historical cultural context of laissez-faire practices and the high value generally placed on personal freedom in Madagascar (Kaufmann 2014). This laissez-faire attitude is reinforced by an ongoing cultural change process towards greater individualization (Goetter 2016). Moreover, restricting privatization of samata parcels does not fit with the traditional ideology that clearing, marking or fencing land legitimates its ownership. Thereby, cleaning for subsistence activities has the same legitimacy as cleaning for privatizing samata or cultivating other cash crops (Réau 2002). Many interviewees claimed that the implementation of rules would have been successful if enforcement and sanctioning had been actively driven by local and communal authorities working together. Experiences from many other Malagasy regions, however, indicate that collective action of the state authorities on a higher level than local communities is generally very difficult to realize (Ferguson et al. 2014). As indicated by the respondents’ statements, the traditional clan authorities and socio-cultural enforcement mechanisms also seem to have lost their power in the course of an ongoing cultural change process. This power vacuum, together with a low (ideological) internalization of the new rules, results in a general lack of compliance. However, traditional rules, such as the taboo on the use of samata near graves, are still internalized rules-in-use and are thus mainly obeyed without any external sanctioning threat. In this paper, we analysed the privatization mechanisms and failed local attempts to curtail this privatization for the important samata-fodder tree among the Tanalana people in southwest Madagascar. New private property rights were created over time through the cumulative behaviour of individual users. Although legalized de jure only decades after their creation, the private property rights to the common pool resource were highly socially accepted from the outset for ideological reasons. A high bargaining power deriving from not caring about open conflict further helped the privatizers to assert their rights and to prevent the enforcement of the new community-based rules curtailing privatization. The curtailment fails, as it relies on an enforcement system inappropriate for this case. It mainly builds on individual user’s motivations for monitoring and demanding sanctioning. This motivation is however mostly very low, as the curtailment rules contradict the users’ personal economic benefits and ideology about resource use. The case study contributes to the understanding of the processes and mechanisms underlying local property rights transformations, and gives an example of self-governance systems for natural resources that “never quite got going” (Ostrom 1998, 17). The problem of low internalization of rules leading to weak enforcement may be exemplary for other self-governance systems in Madagascar and other developing countries. We would like to thank all interviewees, our research assistants Andrianjohary Léopold Clément and Eltos Lazandrainy Fahamaro, our colleagues at BTU for fruitful feedback, as well as three anonymous reviewers for their critical and insightful comments on earlier versions of this paper. This research was funded by the German Federal Ministry of Education and Research (BMBF) within the project SuLaMa (Sustainable Land Management in south-western Madagascar). Agrawal, A (2000). Small is beautiful, but is larger better? Forest-management institutions in the Kumaon Himalaya, India In: People and forests: Communities, institutions, and governance. Gibson, C. C, McKean, M. A and Ostrom, E eds. Massachusetts Institute of Technology, Sabon.Cambridge: MIT Press. Anderson, T. L and Hill, P. J (1990). The Race for Property Rights. Journal of Law and Economics 33(1): 177–197. http://dx.doi.org/10.1086/467203. Andrés-Domenech, P, Saint-Pierre, P, Fanokoa, P. S and Zaccour, G (2014). Sustainability of the Dry Forest in Androy: A Viability Analysis. Ecological Economics 104: 33–49. http://dx.doi.org/10.1016/j.ecolecon.2014.04.016. Battistini, R (1964). Géographie humaine de la plaine côtière mahafaly (Thèse complémentaire de Doctorat des Lettres). Paris: Éditions Cujas. Becker, C. D and Ostrom, E (1995). Human Ecology and Resource Sustainability: The Importance of Institutional Diversity. Annual Review of Ecology and Systematics 26(1): 113–133. http://dx.doi.org/10.1146/annurev.es.26.110195.000553. Behnke, R. H (2008). The drivers of fragmentation processes in semi-arid and arid landscapes In: Fragmentation in Semi-arid and Arid Landscapes: Consequences for Human and Natural Systems. Galvin, K. A, Reid, R. S, Behnke, R. H and Thompson Hobbs, N eds. Dordrecht: Springer. Beyene, F (2010). Driving Forces in the Expansion of Enclosure Among Pastoral and Agropastoral Herders in Ethiopia. Quarterly Journal of International Agriculture 49(2): 127–146. Beyene, F (2011). Dismantling of Common Property, Land Use and Pastoral Livelihoods in Eastern Ethiopia. Journal of Development and Agricultural Economics 3(10): 475–486. Blanc-Pamard, C (2009). The Mikea Forest Under Threat (southwest Madagascar): How Public Policy Leads to Conflicting Territories. Fact Reports 3: 1–12. Cleaver, F (2002). Reinventing Institutions: Bricolage and the Social Embeddedness. The European Journal of Development Research 14(2): 11–30. http://dx.doi.org/10.1080/714000425. Demsetz, H (1967). Toward a Theory of Property Rights. The American Economic Review 57(2): 347–359. Desta, S and Coppock, D. L (2004). Pastoralism Under Pressure: Tracking System Change in Southern Ethiopia. Human Ecology 32(4): 465–486. http://dx.doi.org/10.1023/B:HUEC.0000043516.56037.6b. Eggert, K (2001). Malagasy Commentary. Ethnohistory 48(1–2): 309–318. http://dx.doi.org/10.1215/00141801-48-1-2-309. Ensminger, J (1992). Making a market. The institutional transformation of an African society. New York: Cambridge University Press. Ensminger, J (1996). Culture and Property Rights In: Rights to Nature. Ecological, Cultural, and Political Principles of Institutions for the Environment. Hanna, S. S, Folke, C and Mäler, K.-G. eds. Washington, DC: Island Press. Ensminger, J (1997). Changing Property Rights: Reconciling Formal and Informal Rights to Land in Africa In: The Frontiers of New Institutional Economics. Drobak, J. D and Nye, J. V. C eds. San Diego: Academic Press. Ensminger, J and Henrich, J (2014). Theoretical Foundations of Social Norms: The Co-Evolution of Social Norms, Intrinsic Motivation, Markets, and the Institutions of Complex Societies In: Experimenting with Social Norms: Fairness and Punishment in Cross-Cultural Perspective. Ensminger, J and Henrich, J eds. New York: Russell Sage Foundation. Ensminger, J and Knight, J (1997). Changing Social Norms. Current Anthropology 38(1): 1–24. http://dx.doi.org/10.1086/204579. Ferguson, B, Gardner, C. J, Andriamarovolonnona, T. H, Muttenzer, F, Smith, S. M, Hockley, N and Gingembre, M (2014). Governing ancestral land in Madagascar. Have policy reforms contributed to social justice? In: Governance for Justice and Environmental Sustainability: Lessons Across Natural Resource Sectors in Sub-Saharan Africa. Sowman, M and Wynberg, R eds. New York: Earthscan. Getachew, K. N (2001). Among the Pastoral Afar in Ethiopia. Tradition, Continuity and Socio-Economic Change. Utrecht: International Books. Goetter, J. F (2016). The Cattle Raiders Leave us no Choice: New Transhumance in the Mahafaly Plateau Region in Madagascar. Madagascar Conservation & Development 11(1): 12–22. http://dx.doi.org/10.4314/mcd.v11i1.3. Haller, T (2010). Disputing the Floodplains. Institutional Change and the Politics of Resource Management in African Wetlands. Leiden: Brill. Hoerner, J. M (1990). La Dynamique Regionale du Sous-Developpement du Sud-Ouest de Madagascar. Perpignan: GERC. Horning, N. R (2008). Behind Sacredness in Madagascar In: African Sacred Groves. Ecological Dynamics and Social Change. Sheridan, M. J and Nyamweru, C eds. Oxford: James Currey. Kamara, A. B, Swallow, B and Kirk, M (2004). Policies, Interventions and Institutional Change in Pastoral Resource Management in Borana, Southern Ethiopia. Development Policy Review 22(4): 381–403. http://dx.doi.org/10.1111/j.1467-7679.2004.00256.x. Kaufmann, J. C (1998). The cactus was our kin: Pastoralism in the spiny desert of southern Madagascar In: Changing nomads in a changing world. Ginat, J and Khazanov, A. M eds. Brighton: Sussex Academic Press. Kaufmann, J. C (2004). Prickly Pear Cactus and Pastoralism in Southwest Madagascar. Ethnology 43(4): 345–361. Kaufmann, J. C (2014). Contrasting visions of nature and landscapes In: Conservation and Environmental Management in Madagascar. Scales, I. R. ed. London: Routhledge. Knight, J (1992). Institutions and Social Conflict. Cambridge: Cambridge University Press. http://dx.doi.org/10.1017/CBO9780511528170. Lesorogol, C. K (2003). Transforming Institutions among Pastoralists: Inequality and Land Privatization. American Anthropologist 105(3): 531–542. http://dx.doi.org/10.1525/aa.2003.105.3.531. Libecap, G. D (1989). Contracting for property rights. Cambridge: Cambridge University Press. Lyautey, L. H. G (1935). Lettres du Sud de Madagascar: 1900–1902. Paris: Colin. Middleton, K (1999). Who Killed ‘Malagasy Cactus’? Science, Environment and Colonialism in Southern Madagascar (1924–1930). Journal of Southern African Studies 25(2): 215–248. http://dx.doi.org/10.1080/030570799108678. Middleton, K (2009). From Ratsiraka to Ravalomanana. Changing Narratives of Prickly Pears in Dryland Madagascar. Études océan Indien 42–43: 47–83. http://dx.doi.org/10.4000/oceanindien.729. Middleton, K (2013). Land Rights and Alien Plants in Dryland Madagascar In: Contest for Land in Madagascar. Environment, Ancestors and Development. Evers, S. J. T. M, Campbell, G and Lambek, M eds. Leiden: Brill. http://dx.doi.org/10.1163/9789004256231_008. Mwangi, E (2007). Subdividing the Commons: Distributional Conflict in the Transition from Collective to Individual Property Rights in Kenya’s Maasailand. World Development 35(5): 815–834. http://dx.doi.org/10.1016/j.worlddev.2006.09.012. Namgail, T, Bhatnagar, Y. V, Mishra, C and Bagchi, S (2007). Pastoral Nomads of the Indian Changthang: Production System, Landuse and Socioeconomic Changes. Human Ecology 35(4): 497–504. http://dx.doi.org/10.1007/s10745-006-9107-0. Niamir-Fuller, M and Turner, M. D (1999). A review of recent literature on pastoralism and transhumance in Africa In: Managing mobility in African Rangelands. The legitimization of transhumance. Niamir-Fuller, M ed. London: Intermediate Technology Publications. http://dx.doi.org/10.3362/9781780442761.002. North, D. C and Thomas, R. P (1973). The Rise of the Western World. A New Economic History. Cambridge: Cambridge University Press. http://dx.doi.org/10.1017/CBO9780511819438. Ostrom, E (1998). A Behavioral Approach to the Rational Choice Theory of Collective Action. American political science review 92(1): 1–22. http://dx.doi.org/10.2307/2585925. Patton, M. Q (2002). Qualitative Research & Evaluation Methods. London: SAGE. Rakotomalala, L (1990). Reflexion sur la notion d’espace pastoral dans le sud-ouest de Madagascar In: Elevage et société : étude des transformations socio-économiques dans le sud-ouest malgache : l’exemple du couloir d’Antseva. Fiéloux, M and Lombard, J eds. Antananarivo, Paris: MRST/ORSTOM. Réau, B (2002). Burning for zebu: The complexity of deforestation issues in western Madagascar. Norsk Geografisk Tidsskrift - Norwegian Journal of Geography 56(3): 219–229. http://dx.doi.org/10.1080/00291950260293048. Saldaña, J (2013). The Coding Manual for Qualitative Researchers. London: SAGE. Schlager, E and Ostrom, E (1992). Property-Rights Regimes and Natural Resources: A Conceptual Analysis. Land Economics 68(3): 249–262. http://dx.doi.org/10.2307/3146375. Swallow, B. M and Bromley, D. W (1995). Institutions, Governance and Incentives in Common Property Regimes for African Rangelands. Environmental & Resource Economics 6(2): 99–118. http://dx.doi.org/10.1007/BF00691679. Taylor, M and Singleton, S (1993). The Communal Resource: Transaction Costs and the Solution of Collective Action Problems. Politics & Society 21(2): 195–214. http://dx.doi.org/10.1177/0032329293021002004. Theesfeld, I (2011). Perceived Power Resources in Situations of Collective Action. Water Alternatives 4(1): 86–103. Thielsen, K (2016). Which form of agreement for community based management? Example from southwestern Madagascar. Madagascar Conservation & Development 11(2) in press. UPDR (Unité de Politique pour le Développement Rural). Monographie de la Région Sud-Ouest. Antananarivo: UPDR. Williams, D. M (1996). Grassland Enclosures: Catalyst of Land Degradation in Inner Mongolia. Human Organization 55(3): 307–313. http://dx.doi.org/10.17730/humo.55.3.u46ht013r361668t. Woodhouse, P, Bernstein, H and Hulme, D (2000). African enclosures? The social dynamics of wetlands in drylands. Oxford: James Currey.